8) 1sc then finish off leaving a long tail for sewing. 5) sl st into next st and finish off. Leave long tail for sewing. I stretched and shaped the nose out a bit with my fingers making sure I was happy with the shape and also put nostrils in with black yarn before sewing the nose onto the face. And that's it. 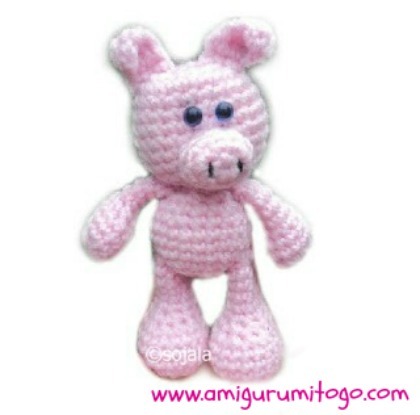 I hope you get your Little Bigfoot Piggy made and I hope you love him or her just like I do! See the rest of my Little Bigfoot Collection listed in my pattern section! These are adorable! Thanks for sharing :) Have you thought of making a giraffe? I would love that! I'm going to make the collection for my son.. He will love them! Update Toni-Nicole!! I got the giraffe made and will post the pattern asap! Your patterns are amazing!i can never make anything crochet wise when reading through directions,but yours was super easy to learn and also very cute(: have you thought of a zebra? I have a few more characters on the back burner. First I want to get a couple more follow along videos filmed for the patterns that have been posted already. A zebra sounds really cool... I'll keep it in mind. this is an old, old pattern, I can't remember what happened there but I do have pigs with tails, a number of newer patterns with curly pig tails that can be used for this pig. If you are viewing from a computer, scroll up, look in the top right corner for the search bar. Type in 'pig". I think you should make a wolf; that way, someone could make a Three Little Pigs playset. You're very welcome and thank you so much for taking the time to comment. I love the request, lol so very cute! This is so cute. Any chance you'll be posting a YouTube video showing this pig? You could actually use another Little Bigfoot video to follow along with. The body, head and limbs are all the same stitch count and shape. The only thing you'd do differently is the muzzle and ears. I hope that helps you out! Hi there! First of all, thank you very much, I'm so glad you like my patterns :) The Jelly Beans are a pay for pattern. I currently have 30 free patterns and 2 pay for patterns. The 2 pay for patterns are available as e-books on amazon or as PDF patterns through Ravelry, Craftsy or Etsy. You can find those links if you scroll a little ways up this page and look on the right-hand side. Cute pattern! About how tall is the finished pig? Hi there, so sorry but I can not do that right now. I only have patterns for sale at this time because I am strapped for time. I do have a row by row video for this bee if you want to give it a try, it takes you through every stitch. Hi Sharon, thank you so much for gracefully sharing your patterns. My result of the piggy is to see on my blog: http://liszha.blogspot.nl/2013/02/pig-farm.html And ofcourse I did link to your blog. Thanks for sharing your pictures with me, they were fun to look at. Hi Ros, no sorry I haven't. I did think about it so maybe one day I will, nothing planned at the moment. I sure do appreciate your message, it was lovely to hear from you. Your little pig is gorgeous. I would like to use the print friendly button, but the only thing I than get are advertises. Also on your website I see a lot of advertises I don't like to see. So I am sorry that I can't use the nice pattern. And yes I already tryed to changed my account for Google to remove all these advertises. Notting changed. When you click on the print friendly the pop up box will appear and then look in the top left hand corner of the pop up box, there is the print icon and click on that. The pattern should be sent to your printer. I'm making this little guy right now, and he's coming along nicely. I found an alternative way for Head Row 4. I like to space out my stitches evenly, and this looks just as nice. thank you... yes, that would be confusing but that's because you were doing 2 different patterns. This is a tiny pig I designed in 2012. I redesigned this pattern in 2014, the difference being the head and body are now one piece and the overall pig is larger. 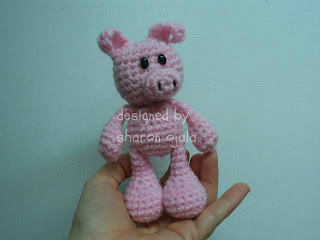 I also have one other pig pattern called the dress up pig and they are even larger and a completely different pattern altogether. Click here for the revised Little Bigfoot Pig You can also scroll up, look on the right hand side you'll see a list of labels, click on "pig" and all my posts with pig patterns in them will pop up.